Forty years ago the Government of Quebec put the Broadback River on notice for its destruction by way of hydro-development. Today the Crees request the river to be put on notice for its protection. "Forty years ago the Government of Quebec put the Broadback River on notice for its destruction by way of hydro-development. Today the Crees request the river to be put on notice for its protection." "In Waswanipi's traditional territory, only the areas around Lake Evans and immediately north of the Broadback river remain road-less, untouched by forestry development. Once these areas are gone, there will be no place left in Waswanipi to show our children what the forest was once truly like when our elders thrived there. " Building upon the existing protection of the Assinica National Park Reserve that was announced in 2011, the Crees' Broadback Watershed Conservation Plan would establish inter-connective core protected areas along the river's corridor and special conservation management zones that would serve as buffers to the core protection. In creating this conservation plan, the Crees also hope to protect the dwindling herds of woodland caribou that reside in the watershed. The Crees believe that their approach is the only credible way for governments to fulfill their legal obligations to protect locally endangered woodland caribou herds that were classified as "non-sustaining" by a recent GCCEIICRA and Quebec Ministry of Natural Resources commissioned study. "The Crees have been fortunate enough to receive wide support for their conservation efforts in the past. We hope that this support continues for our efforts to protect the 8roadback River for benefit, not only of the Crees and the residents of James Bay, but for all who appreciate the importance of retaining rare intact ecosystems. We know our territory will undergo tremendous change in the coming years and this is why we must act now to ensure there is sustainable balance in this change." In 2002, during the signing of the Paix des Braves, the Quebec government signed a letter recognizing that the Mistissini and Ouje-Bougoumou Cree traplines outside the JBNQA territory would be treated as traplines within the new adapted forestry regime. However overharvesting occurred in those areas and for several years, the Crees fought with Quebec over this malpractice. Concurrently, the CNG and certain Cree communities were demanding that the the Broadback area be protected from development. As very little movement was occurring, the CNG and Quebec decided to add this proposal to the new agreement as compensation for areas lost. 57% of the proposal was realized and further protection was added north of the proposal. But this is not the end for the Broadback protection. A Cree-Quebec taskforce was created to increase protection in Waswanipi territory,who felt that their lands were not protected enough. Overall and at present, 12 traplines are now over 50% protected and we should also rejoice in seeing the protection of Waswanipi, Evans, Du Tast, Dana, Giffard and Theodat Lake along with smaller lakes and rivers; Old Nemaska along with their rock paintings and a caribou habitat in Assinica Park. This agreement did not close any doors but only begins a new phase for the Cree Nation in terms of creating new protected areas. The Broadback River and the surrounding watershed area is considered by the Cree to be a regional conservation priority. For the Cree, this area represents a rich natural and cultural heritage; passed on from their ancestors, and borrowed from their children. Conserving the integrity of this area for future generations is therefore of upmost importance. Located within the southern portion of the Cree territory (Eeyou Istchee), the Broadback is one of the last remaining large rivers in the boreal forest that has not been affected by hydroelectric development. Conservation has not kept pace with development in the southern portion of the Cree territory. Forestry development and mining exploration is advancing at a rapid pace, and a certain urgency exists in order conserve the ecological and cultural integrity of this area. The implementation of the Broadback River Conservation Area concept represents a major opportunity to move towards a better balance of conservation and development in this sub-region of Eeyou Istchee. The Cree are very concerned by the decline of forest-dwelling woodland caribou. This species is federally listed as threatened, and provincially considered “vulnerable”. A recent study has confirmed that the three herds (Nottaway, Assinica and Temiscamie) are not self–sustaining, and are predicted to decline in the future should disturbance on the herds and their habitat continue without the introduction of new conservation measures. The Broadback River Conservation Area represents a critically important habitat for this species. Cree tallymen and elders have reported many observations of these animals on the territory. Many western science studies have confirmed that the area as one of the most important in Québec for forest-dwelling woodland caribou. The protected area would contribute to advancing Québec’s objectives in its forest-dwelling caribou recovery strategy. The Broadback River Conservation Area could contribute a very large (> 10,000 km2) protected area, which could meet the habitat needs for forest-dwelling woodland caribou. The surrounding Special Management Zones would be designed with Woodland Caribou Conservation goals in mind. Conserving the Broadback Area is of critical importance to maintaining the Cree way of life, centered upon hunting, fishing and trapping. The Cree have used the forests, wildlife, lakes and rivers intensively since immemorial. The Broadback River and its tributaries has served the Cree as a key travel route to move through this territory; just as highways are used today. Approximately 40 traplines (or family hunting territories) are situated within the Broadback watershed. The boundaries of traplines follow the natural landscape, mainly by the flows of rivers. The trapline boundaries have been defined by the Cree, and they serve as sustainable resource management areas overseen by an “Indoho Ouchimau” or tallyman. The Mishigamish area, north of the Broadback River in the Waswanipi sector, is of key importance to the people of Waswanipi. 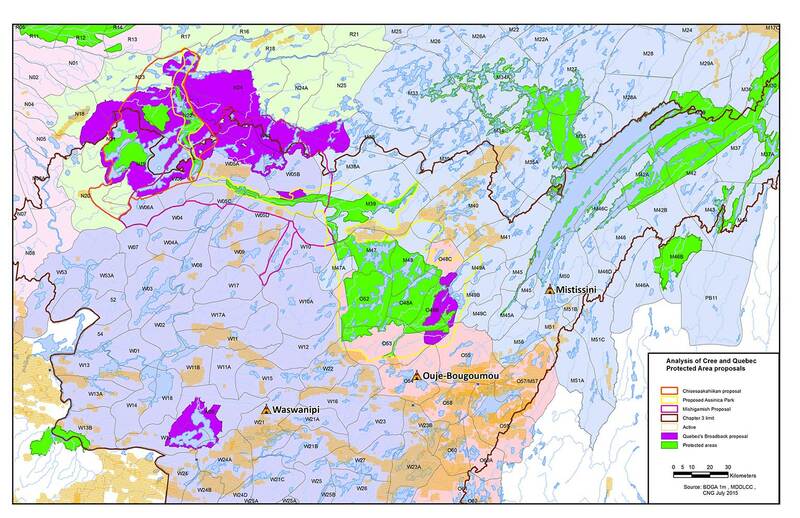 Nearly all of Waswanipi’s territory has been permanently altered by industrial forestry and the related road network. Only a few traplines in the Mishigamish area have remain intact in their natural state. Protection from industrial development for the Mishigamish area is critically important as it is the last area in Waswanipi’s territory where people can continue to experience the traditional Cree way of life, in the way of their ancestors did before them. The Broadback river flows in and out of Lake Evans (Chisesaakahiikan in Cree), which at 450 km² is one of the largest lakes in Québec. Evans is also the largest natural lake south of the 55th parallel that remains for the most part inaccessible by road. It is known for its clean water, plentiful stocks of pike, walleye, trout and sturgeon which has always sustained the Cree. It is also a popular destination for sport fishermen, who access it through outfitting camps. 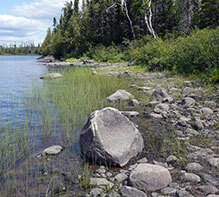 Safeguarding the integrity and remoteness of Lake Evans is of the upmost importance for the Cree. Another area priorized for protection is Old Nemaska. Long before contact with non-Aboriginals, Lake Nemiscau (Nemaskau sakhegun) was a trading place where northern Cree met with southern Cree, and with other Aboriginal peoples from the south. It was a place to socialize and trade for goods that were not readily available in their areas. During the fur trade period, various companies operated trading posts on Lake Nemiscau. The Nemaska people gathered every summer at Old Nemaska to trade goods, socialize, and smoke and preserve many species of fish for winter. The people of Nemaska continue to gather there to this day. Lake Nemiscau also features an important pictograph (rock painting) site, which archaeologists have referred to it as one of the most important in Quebec, due to its size (over 35 metres) and to the complexity and richness of the motifs. The mineral potential of the whole the Area of Interest for the Broadback River Conservation Area should be studied and evaluated. The areas already proposed for protection and for future protected areas expansion should be made off limits to mining claims immediately, until decisions have been taken with regard the boundaries of protection. The request for the suspension of new mineral staking for the Mishigamish and Chisesaakahiikan areas was been made to the Quebec Government by the Chiefs of both Nemaska and Waswanipi in 2010. Actions must be taken to implement these measures. Mining activities in the Special Management Zones would need to be evaluated before permits are issued, to in order to ensure that they are in line with the conservation and development objectives set out for each zone. The Cree are interested in the potential for world class tourism in the Broadback River Conservation Area. The proposal concept is well suited for developing future Cree tourism opportunities that are not possible in an industrial development context. The implementation of this Conservation Area concept is seen by the Cree as a way to encourage both the general public and future generations of Crees to enjoy the natural beauty of this area, and to connect with wilderness, wildlife and the Cree culture. The Assinica National Park represents the main vehicle for tourism vehicle for this area. As a national park, Assinica will be designed, funded and managed to encourage tourists to come visit the park. The tallymen and land users will play a key role in tourism development. A tourism management plan guide which tourism related activities are promoted in different sectors of the park. The tallymen and the Cree Nation of Nemaska are interested in the potential for world class tourism in the Lake Evans area, as well as in the opportunities for employment and economic benefits related to these activities. Maintaining the remoteness values and the ecological integrity of Lake Evans will create a context where high quality Cree tourism opportunities are possible. The Broadback river watershed is full of tourism potential which has yet to be explored and developed. One of the organizations that can assist in developing the tourism potential is the Cree Tourism and Outfitting Association (COTA). Its main objective is to develop sustainable ecotourism while preserving the Cree way of life. Partnerships with Cree organizations and entities will be key to developing the full tourism potential of the area. There exists synergies with other related tourism attractions in the area, such as Aanischaakamikw (The Cree Cultural Institute), which provides visitors with a fascinating window into Cree culture, and is located in a beautifully designed building in the Cree community of Ouje Bougoumou. The Albanel-Temiscamie-Otish National Park, with its headquarters in nearby Cree community of Mistissini, will attract a tourist base that might also benefit tourism for the Broadback River Conservation area. The Broadback has about a dozen rivers that serve as major tributaries, beginning with the Assinica in the headwaters area. The recently established Assinica National Park Reserve serves as a core anchor for the protection of the headwaters of the Broadback River. The park provides the spinal cord and connectivity for anchoring the proposed Mishigamish and Chiisaakigan protected areas. Further downstream, the river flows through areas characterized by muskeg and wetlands where it eventually meets the open waters of James Bay. The conservation area represents a mix of protection, conservation measures and management approaches that together would provide for comprehensive conservation for the Broadback watershed. 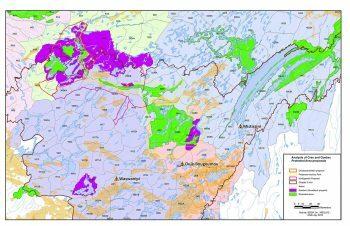 Some protection zones could be expanded to better protect Cree values and areas of interest and/or to meet woodland caribou protection needs. The special management zones would be designed to achieve both conservation and development objectives, and to serve as buffer zones for the core protected areas. Serve as core anchor for Broadback watershed protection. Provides key connectivity between different sectors for the watershed conservation concept. Tourism development will be play an important role in park management and expansion area. Can serve as tool to enhance Cree management in the Assinica headwaters area. Orientations could evolve to enhance woodland caribou conservation and Cree land use activities. - The Mishigamish and Chisesaakahiikan proposals come together at Lake Evans, which is of shared protection interest. - Important woodland caribou habitat. 5. 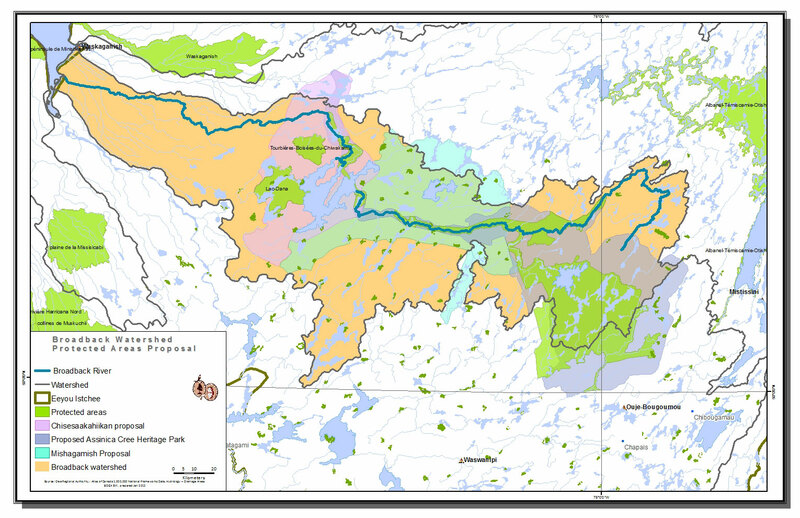 Special Management zone A (North of Assinica Park Reserve in Mistissini sector). This area could feature a modified forest management and road access approach, to serve as a buffer zone for the core protection areas, and to enhance the use and management of areas that are highly valued by the Crees of Waswanipi. Different approaches can be developed to enhance conservation and wildlife management in this sector, which features large areas of muskeg and marsh. The Broadback River Conservation Area would be managed by sector. The sectors would be defined by the limits of the trapline territories associated with each community. This way, the leadership over the management of different sectors of the conservation will be shared by all of the Cree communities and land users.